HONG KONG (CNS) — Bishop Peter Shao Zhumin of Wenzhou has been released by Chinese authorities after being detained for more than seven months, reported ucanews.com. The bishop, who has not joined government-approved associations for church officials, was released Jan. 3 and was expected to return to Wenzhou, one of China’s biggest Christian cities, in late January. A source who wanted to be unnamed told ucanews.com that after Bishop Shao was taken away in May, officials from Wenzhou City Bureau of Ethnic and Religious Affairs tried to force him to sign an agreement. The agreement requested the bishop to support the State Administration for Religious Affairs and the self-election and self-ordination of bishops. After a lot of pressure, Bishop Shao signed the agreement but added a remark that he did not agree with the terms, the source said. “What the government is doing is like the Cultural Revolution, arresting you and forcing you to sign documents to support the authority,” the source said. 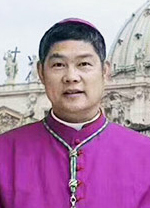 Bishop Shao was taken from his diocese May 18, his fourth detention since he was confirmed as a bishop in September 2016. “However, it was the first time that officials from Wenzhou City Bureau of Ethnic and Religious Affairs were involved to arrest him; while only national security officials did so in the past,” the source said. The reason for the detention is still a mystery, but it is believed that a new director of Wenzhou Provincial Administration for Religious Affairs wanted to resolve “problems” concerning Bishop Shao, by getting him to join the State Administration for Religious Affairs, ucanews.com reported. As of Jan. 10, Bishop Shao was staying in a Catholic’s home in Xining, 1,500 miles away from Wenzhou, and was scheduled to travel to Beijing for a hearing check Jan. 22 before returning home. Bishop Shao has a congenital ear disease. Last September, during his detention, he had ear surgery in Beijing. Last June, the Vatican said it was saddened by the disappearance of Bishop Shao. The German government also publicly expressed the hope that the bishop would be released.